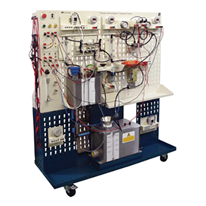 A purpose built trainer consisting of a mobile work station and a modular range of industrial process sensors and transmitters for the study of their calibration and their applications. Based on a mobile trolley that incorporates all electrical, water (including a water heater) and air controls, the system provides a totally self-contained unit. The punched front panel provides a construction area that allows devices to be fixed to it via a series of keyhole slots. The instrumentation devices are mounted on robust carriers that allow them to be located and locked onto the front panel.